Northern Dock Systems is an industry leader in the sales and service of dock levelers, dock seals/shelters, industrial doors, HVLS Fans, air barriers and overhead door service. All our services are centered around our core values: improving safety, productivity, and reducing energy consumption. Building a business in 2001 based on honesty and integrity has allowed us to gain a reputation within the industry as an innovative company that partners with their customers to offer expert consulting advice geared towards developing strategic and highly customized full-scale solutions to ensure the best customer satisfaction. In addition to our top-notch product line-up, our service technicians and staff are some of the most experienced in the industry. Our fleet is equipped with over 30 trucks including service and installation with boom cap that allow us to tackle even the toughest installation, preventive maintenance and electrical tasks. 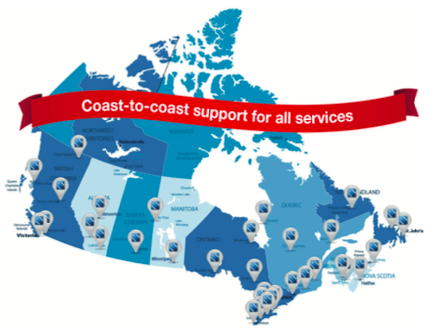 Our office staff, management and technicians work together, communicate frequently and utilize the latest technology to provide seamless customer satisfaction across all levels of the organization, offering services across Canada. By building a honest, fair, and consistent organization, Northern Dock Systems is able to offer some of the most professional installations and high-quality products backed by industry-leading warranties. • Launched asset management to better keep track of equipment condition, easily retrieve historical data and make fact-based decisions on prioritizing equipment repair. • Northern Dock Systems became the official Master distributor for MacroAir HVLS Fans in Canada. • Expanded Mississauga head office to new headquarters at 415 Ambassador Drive. • Northern Dock Systems is recognized as a leading contributor towards commercial energy solution programs by a major utility company. • Northern Dock Systems obtains exclusive rights to Whalenado HVLS Fans distribution/sales. • Electrical Services division is launched. • Northern Dock Systems obtains exclusive rights to ASI Doors distribution/sales. • Opened New Construction division. • Started the sales and distributing of HVLS Fans. • Opened second location Cambridge, Ontario to focus on construction sales. • Chris Brady joins Northern Dock Systems as a partner to strengthen and develop the sales department. Exclusive rights to DL Manufacturing distribution/sales were obtained. • Northern Dock Systems is founded by Kirby Moore with exclusive rights to sell and distribute Nordock products.